(Old Persian/Avestan endowed with the Glory of Righteousness) Brother or near-relation of Darius, Great King of Persia, and Satrap of Sardis. A senior Persian with powerful connections. This picture is thought to be a senior Persian noble of the time of Darius. Virtually everything we know about Persia from this period comes from Herodotus—and archaeology. If the information on Archaic (that is, pre-Marathon) Greece seems sketchy, try to learn something about Persia! Was there a single Artaphernes with a long military career, or did he have a son by the same name? Is Artaphernes entirely a figment of Herodotus? It is very difficult to say, and I don’t believe there is a shred of proof that such a man existed save his name in the Histories. But I have tried to bring him alive, as a heroic character, by no means a villain. There’s a fundamental flaw in the way we read history; Greeks good, Persians bad is one, and I hope, through my writing about Artaphernes and his position as a tough, capable, honourable commander facing a massive counter-insurgency problem in Ionia, that some of my British and American readers may feel a little more kinship with him, and a little less with the Greeks. Yes, eventually the Persians behaved brutally—barbarically—in the Ionian revolt. The image on this page is of an artifact from Persopolis. 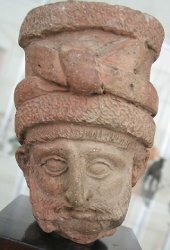 Note that under the fur-lined cap is a face that might just as easily be Greek, and remember that the Greeks and Persians had more in common with each other, in many ways, than with any of their other rivals.